Apple pie, hands down my favorite dessert of all time, is one I spent years trying to master. 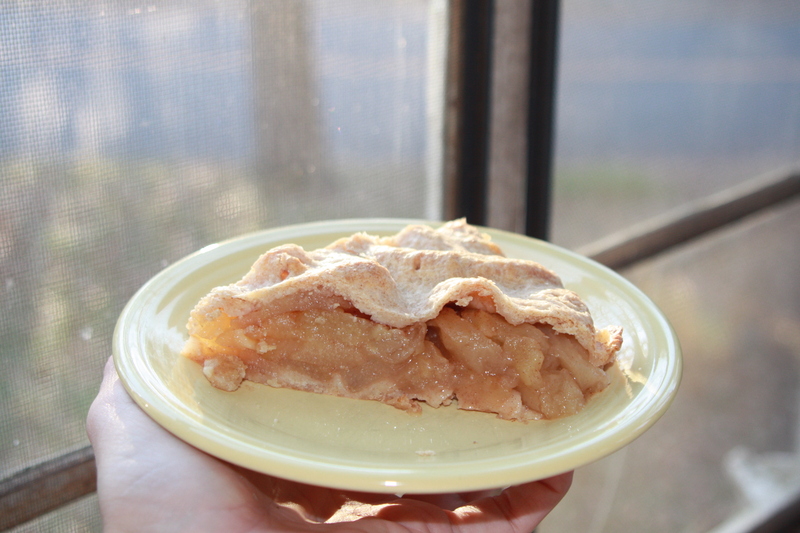 There are lots of recipes out there for the ‘perfect’ apple pie – and I’ve read most of them. Most of them advise using a certain type of apple – and most are limited to one variety. The key to a really great apple pie is to mix up your varieties. Right now, with some of the most flavorful apple varieties available around Central Virginia, is the time to make an apple pie. And maybe one for the freezer. I posted a small brag on Facebook the other day about my awesome apple pie and have received a number of requests for a recipe. I’ve given it out numerous times to friends, I’ve shared my pie crust recipe here previously, as well as my technique for making the crust. It has been suggested I teach a pie making class, which has definitely been on the list of classes I’d like to teach if only I could find a space to teach out of. I’ve written both here and in local publications about the building my dear friend Betty has been rehabbing. What I haven’t written about is that for most of that time, we have talked about me using some of that space to organize my own cooking classes, among other ideas we have had percolating for several years. With the building mostly complete, we’ve decided to set a date for my first class. I could not be more excited. On Thursday, November 21, I will be teaching “Holiday Pies” at 6:30 pm. This will be a small, hands on class. We are going to talk pie, we are going to make pie and most importantly, we are going to eat pie. I will send everyone home with recipes to all my favorite holiday pies as well as a crust and the skills for you to make your own fabulous pie just in time for Thanksgiving. There is a $25 fee. If you are interested, email me or leave me a comment with your email address. Space is limited, but if there is enough interest, there will certainly be another class before Christmas. By the end of the class, you will understand why they say something is as easy as pie. Because it is. Wines (and beer) I drank – Birthday Edition. MMMMM…with my cache of central Virginia apples, I think I’ll make an apple pie today! I’ve made two this week. Pie, it’s what’s for breakfast. And lunch. And dessert…. Sign me up, please!!! Save me a spot. I am so in!!! I’m interested! Let me know what I need to do to sign up! I’ll drop you an email! Lemme see what I can do with my work schedule. That IS the trick–mix up all the apples! Gah! I don’t know how I missed this. I’m in for the next one for sure! We are definitely planning more!